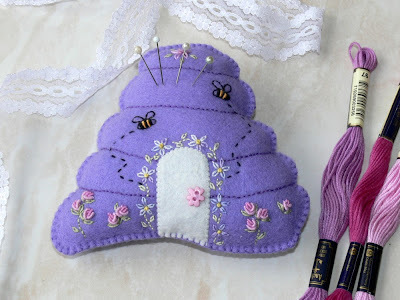 Hollyhock Cottage is a sweet needle case in the shape of a delightful cottage. It is mostly hand-stitched and measures 11 x 13.5 cms (4½ x 5½ inches). This pretty pincushion is a joy to embroider. It measures 14 cm (5½ inches) square and features a delightful stitchery in the centre. It would make an ideal gift for your stitching friends. 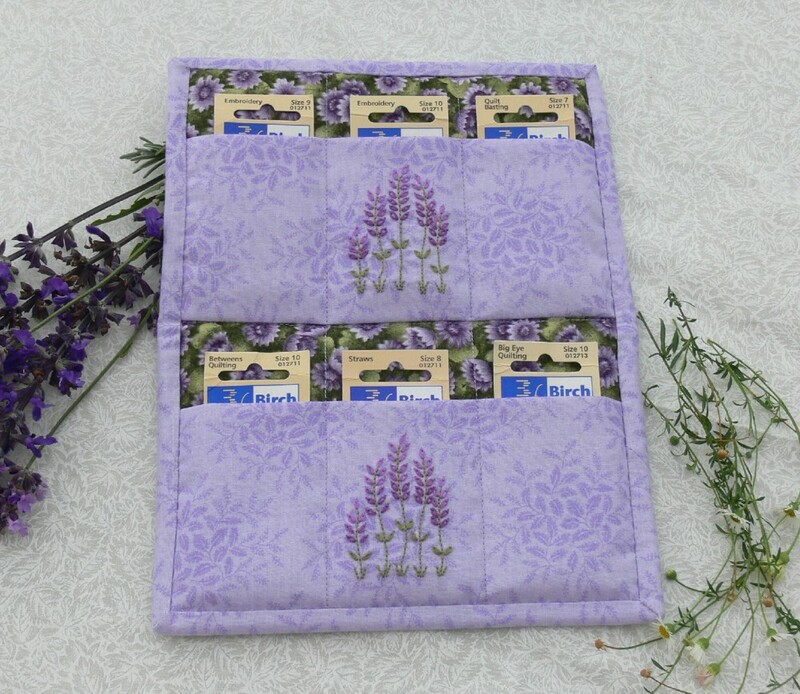 roomy pockets and is embellished with lavender stitcheries. Finished folded size 5 x 8 inches ( 13 x 20 cm). Do you like to use a number of needles when you are stitching so that you don’t have to keep re-threading with different colours? 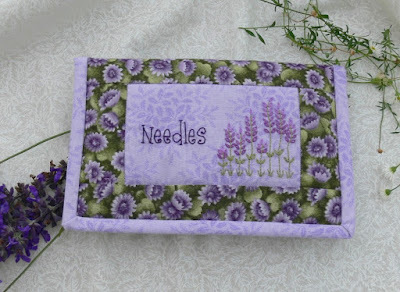 Then you need a pincushion big enough to hold lots of needles with threads hanging out, without them becoming tangled. Why not have it pretty, as well as a generous size! That’s the gorgeous Wildflower Cottage - coming in at a generous 18 cm (7 inches) square. 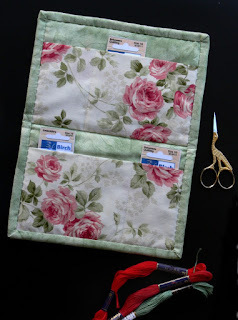 Measuring 13.5 x 20.5 cm (5¼ x 8 inches), this sweet project is designed with six pockets to contain your needles in their packets—no more wondering what size and type of needle you have in your hand. 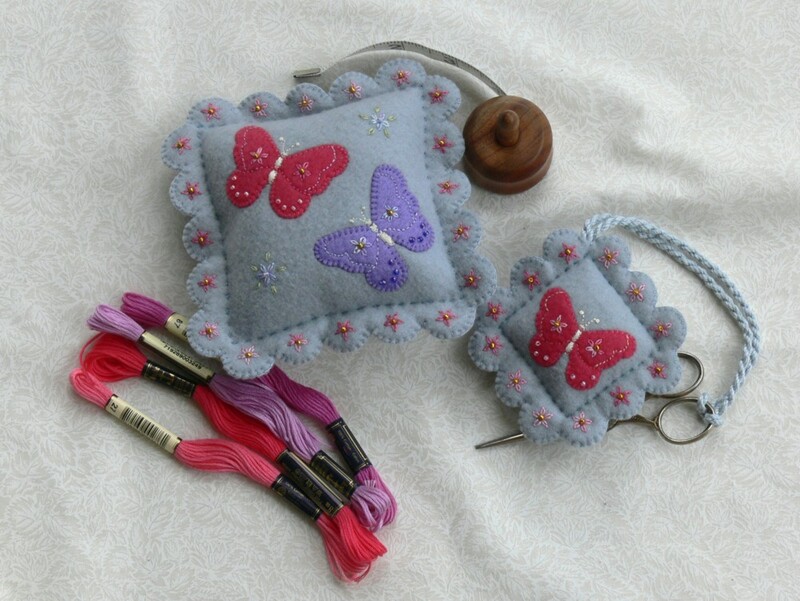 The delightful stitchery is easy to work and is embellished with a scissor charm. Thread’n’Stitch is a jaunty little pincushion that you just can’t resist! It is fun to put together and you don’t even need a sewing machine. 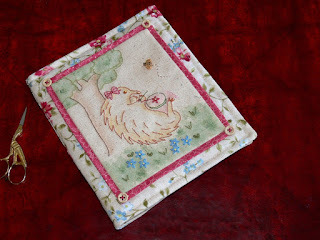 Measuring 6 inches square, this would make an ideal gift ... or make one for yourself and be the envy of all your sewing friends. With busy bees hovering around, this little felt pincushion is a delight to make and use. Embroidery uses a variety of stitches to enhance the sweet design. 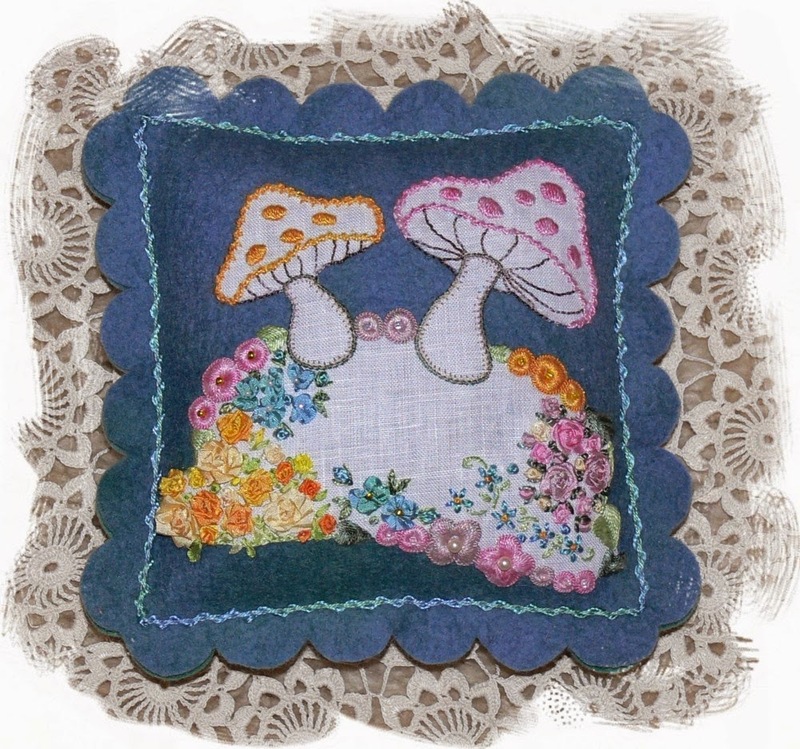 The pincushion measures 11 x 13 cm (4½ x 5 inches). This exquisite pincushion is almost too beautiful to use! It measures 18 cm (7 inches) square and is embellished with beautiful hand-dyed silk ribbons and threads to create a magic garden. 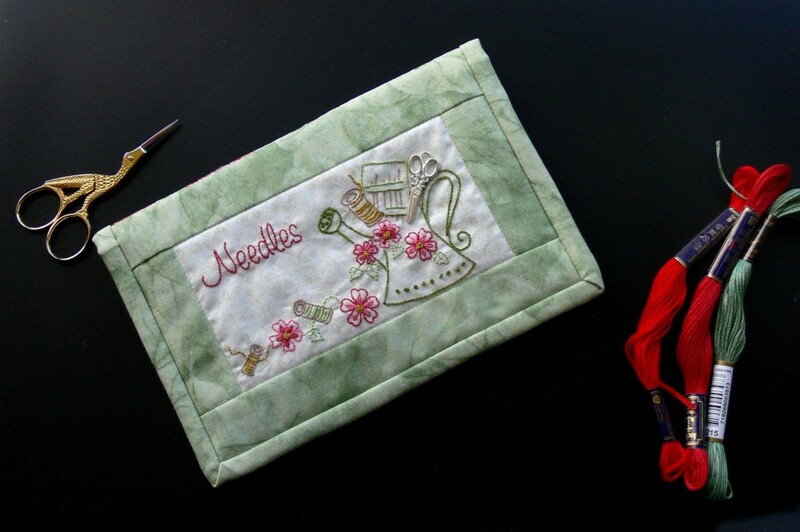 This cute needle case has six pockets to store your needles in their packets. That makes it easy to find exactly the size and type of needle you need. 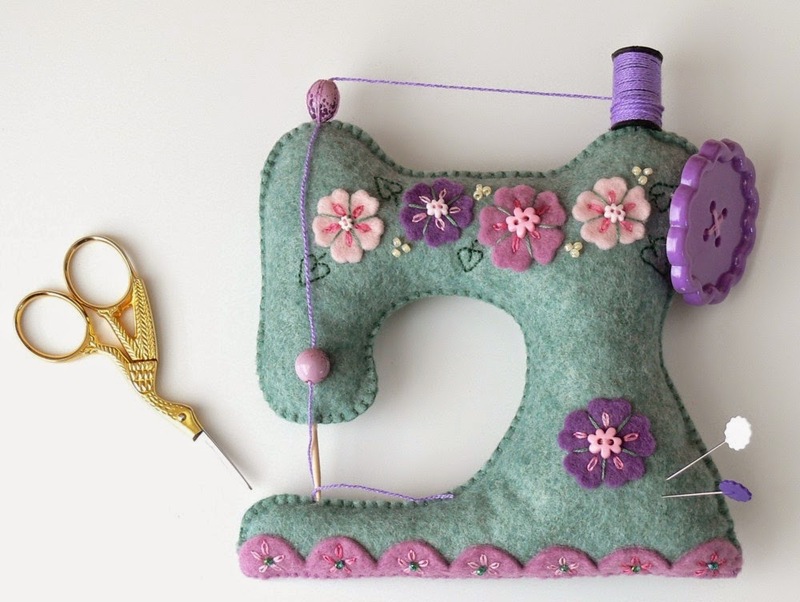 The delightful stitchery is easy to work and a little bit of colour adds to its charm. 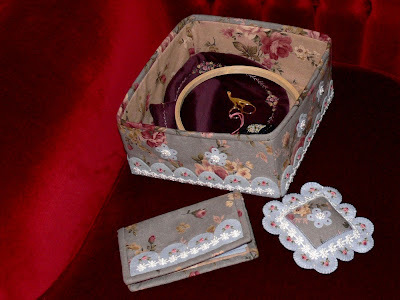 The needle case measures 18 x 20 cm (7 x 8 inches) and 20 x 35 cm (8 x 14 inches) opened. 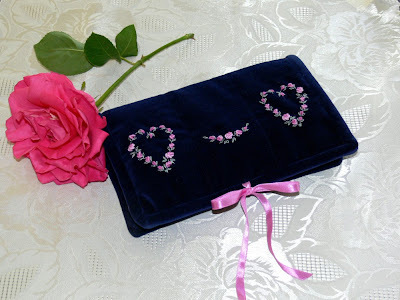 This sweet needle case is 15 cm (6 inches) in diameter and has a heart scissor pocket on the back. Its lovely embroidery is framed with delicate guipure lace. The inside felt is decorated with seed beads and the covers are edged with a hand-made cord. 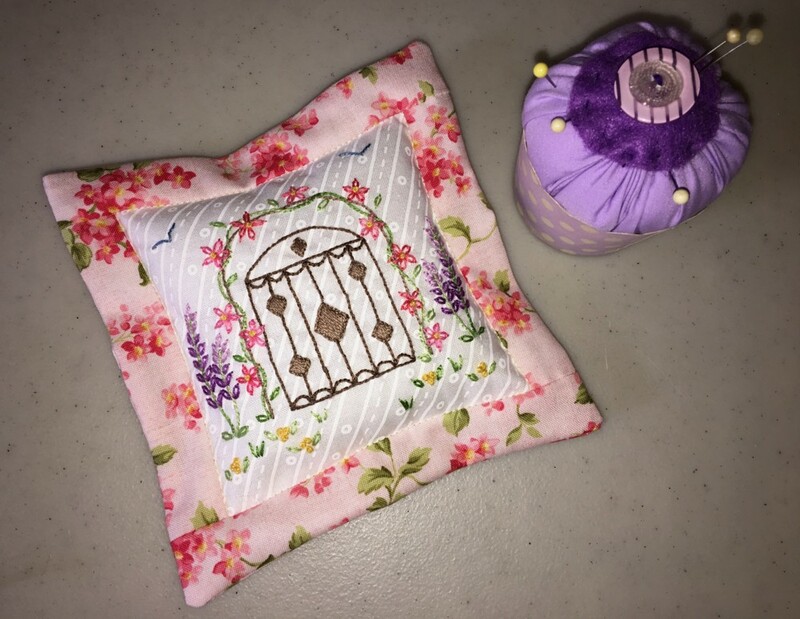 Put your threads, pens and bits and pieces in the pouch, your needles in their needle case, pins in the heart pincushion and scissors in their case. 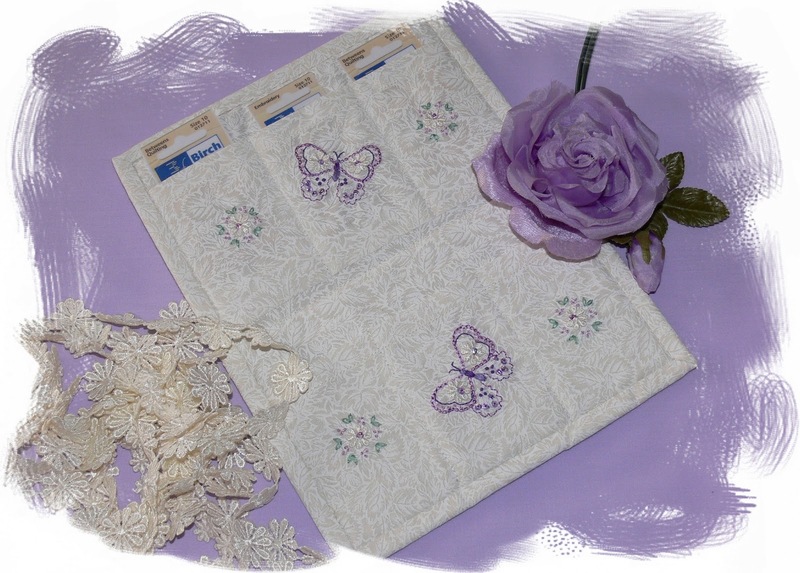 Everything is beautifully ready for your next stitching project. 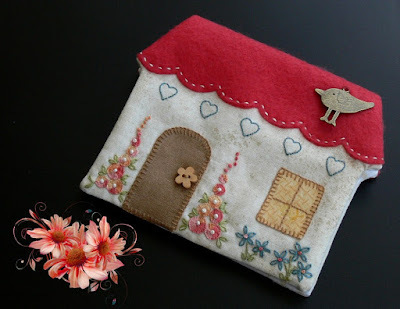 The pouch measures 9 x 20 cm (3½ x 8 inches) and each piece is embroidered with grub roses, lazy daisy leaves and French Knots. 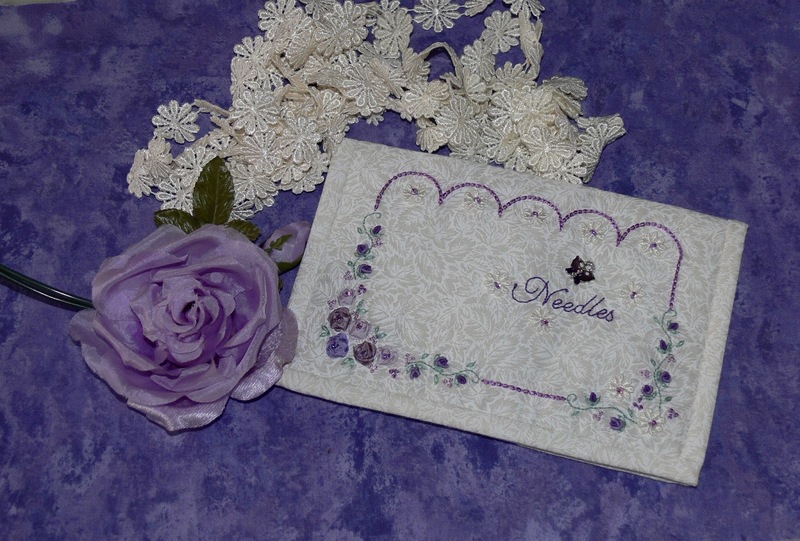 Butterfly and Roses Needle Case is a delightful combination of roses, daisies and practicality. Measuring 13 x 20 cm (5½ x 8 inches), the project is designed with six pockets to contain your needles in their packets—no more wondering what size and type of needle you have in your hand. Beautiful silk-ribbon roses, guipure daisies, embroidery stitches and beads embellish this gorgeous stitching accessory. 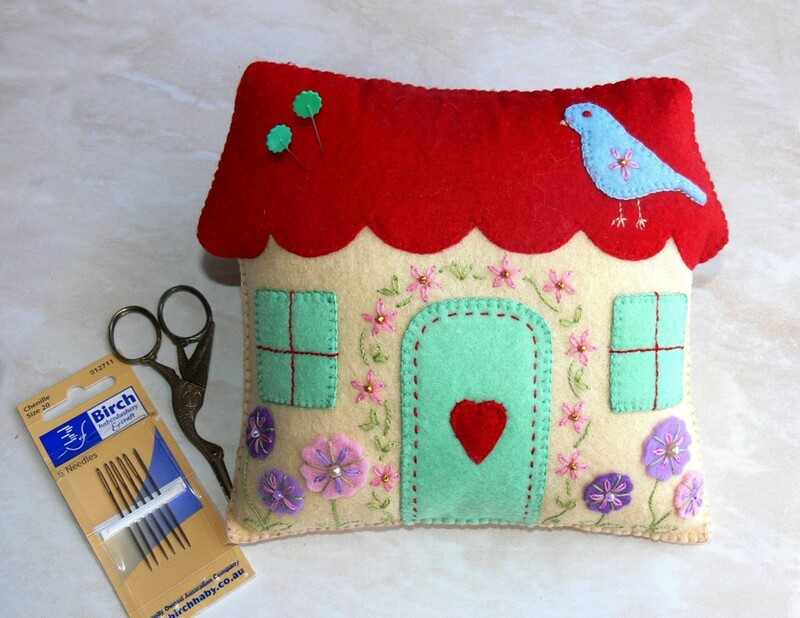 This sweet sewing set consists of a pincushion and matching scissor keep. 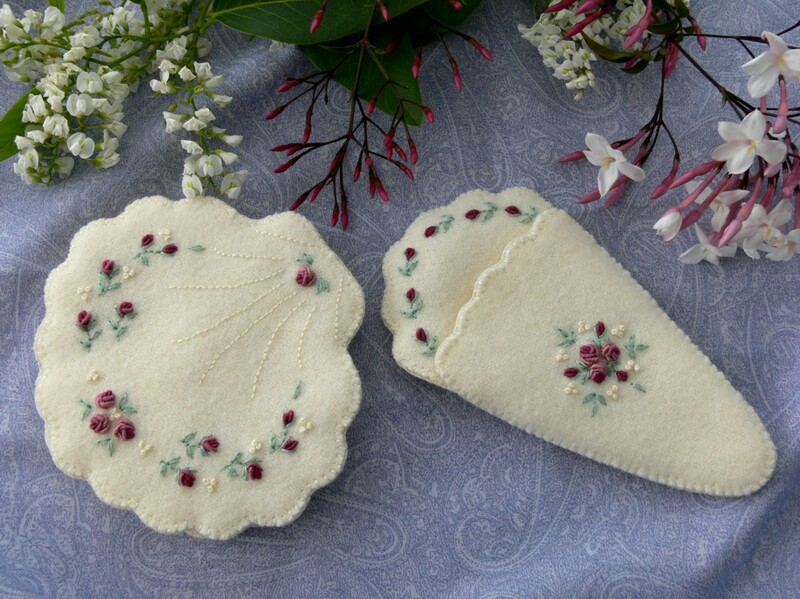 They are made from felt with appliqued butterflies, embellished with embroidery and beads. The pincushion measures 14 cm (5½ inches) square and the scissor keep 9 cm (3½ inches) square. They would make a lovely gift. Keep your packets of needles in order in this exquisite Needle case, measuring 13 x 20 cm (5 x 8 inches). 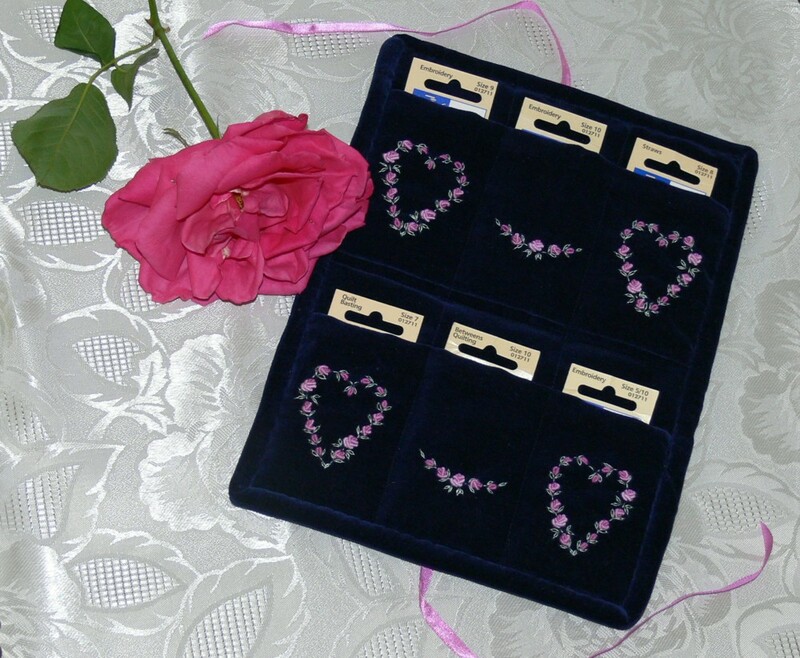 The velvet case is decorated with hearts and swags in embroidered grub roses and has six pockets for your needle packets. This delightful three-piece set uses a number of techniques, combining felt and fabric, inset applique, embroidery, twisted cord and tassel. Beads and a charm add a lovely embellishment. The hexagonal needle case measures 14 cm (5½ inches), the pincushion 13 cm (5 inches) and the scissor-keep 8 cm (3 inches). This charming set is embroidered with beautiful silk threads—a joy to use and a delight to look at. Some lovely beading provides the finishing touch to the design. 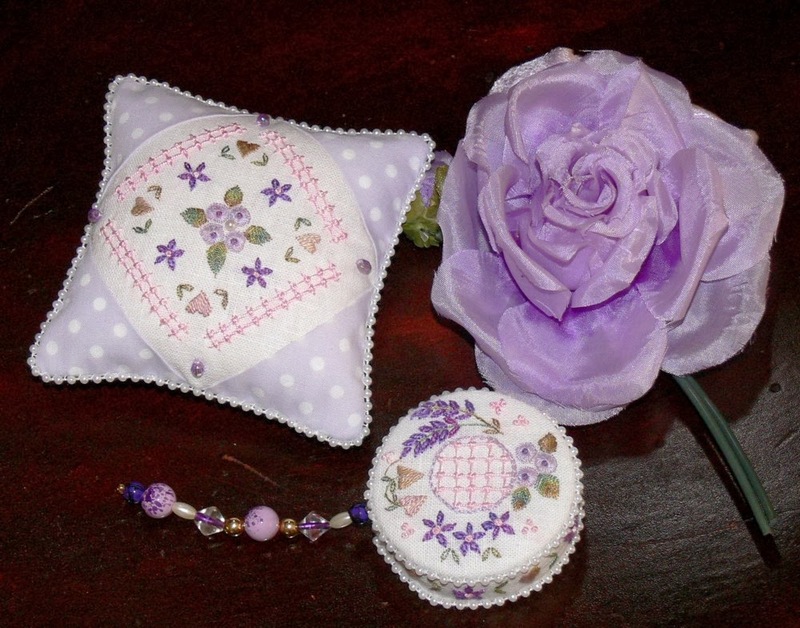 The Pincushion is 10 cm (4 inches) square and the Tape Measure Cover 5.5 cm (2¼ inch) diameter. 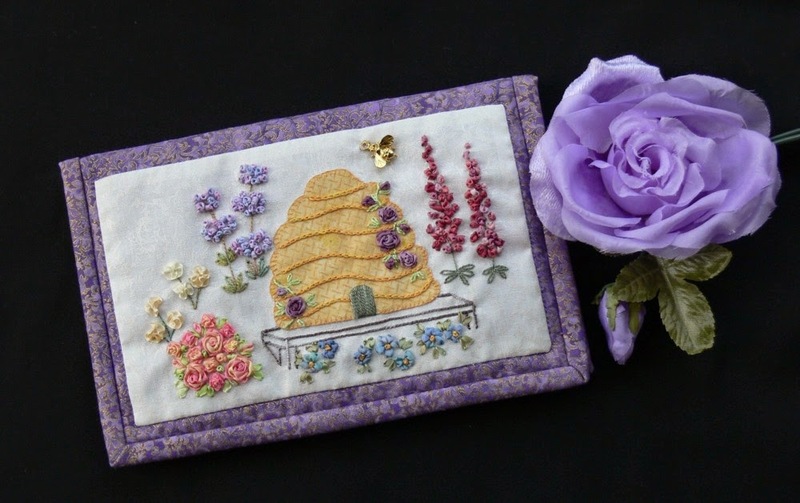 The Beehive Needle Case is a delightful combination of silk ribbon embroidery and applique and is ever so practical. Measuring 13 x 20 cm (5½ x 8 inches), the project is designed with six pockets to contain your needles in their packets—no more wondering what size and type of needle you have in your hand. 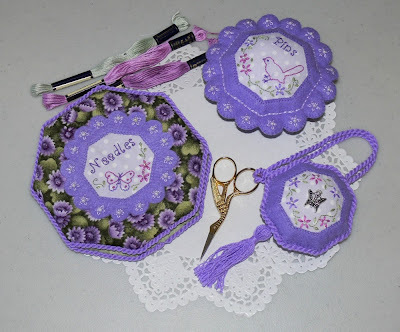 Surround yourself with beauty with ‘Sweet Nothings’, an exquisite sewing set combining hardanger and silk ribbon embroidery. 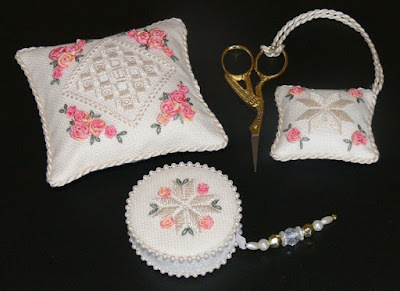 The Pincushion measures 10 cm (4 inches) square, the Scissor Keep 6 cm (2¼ inches) square and the Tape Measure cover 6 cm (2¼ inches) diameter. 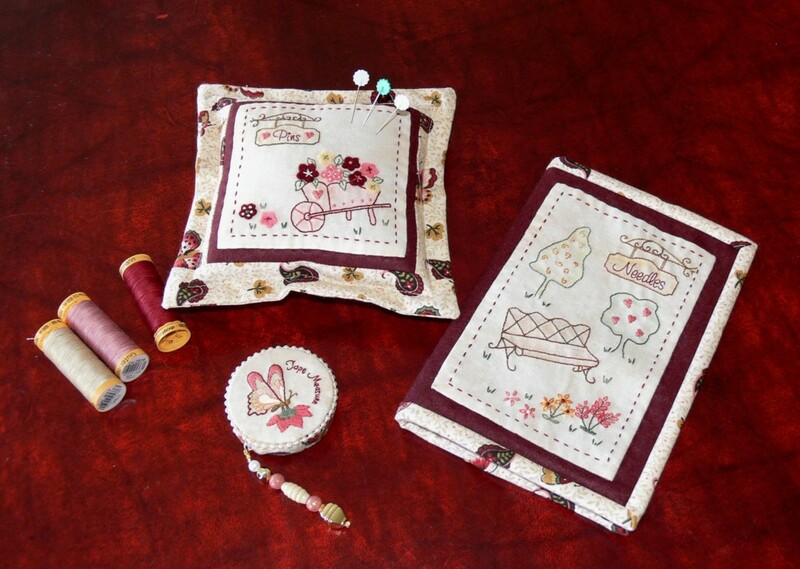 This lovely set consists of Needlebook, Pincushion and Tape measure with pretty garden stitcheries. With just four different stitches used, the project is easily achievable and would be a lovely addition to your sewing basket. 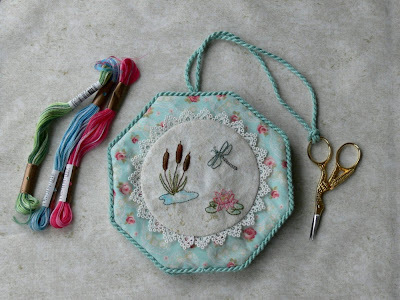 Needlebook: 13½ x 19 cm (5¼ x 7½ inches), Pincushion 16½ cm (6½ inches) square, Tape measure 5½ cm (2¼ inches) diameter. Spoil yourself or make one as a gift! This gorgeous set consists of a 23 cm (9 inch square) Workbox, a Needlecase 10 x 16 cm (4 x 6½ inches) and a Pincushion 13 cm (5 inches) square. 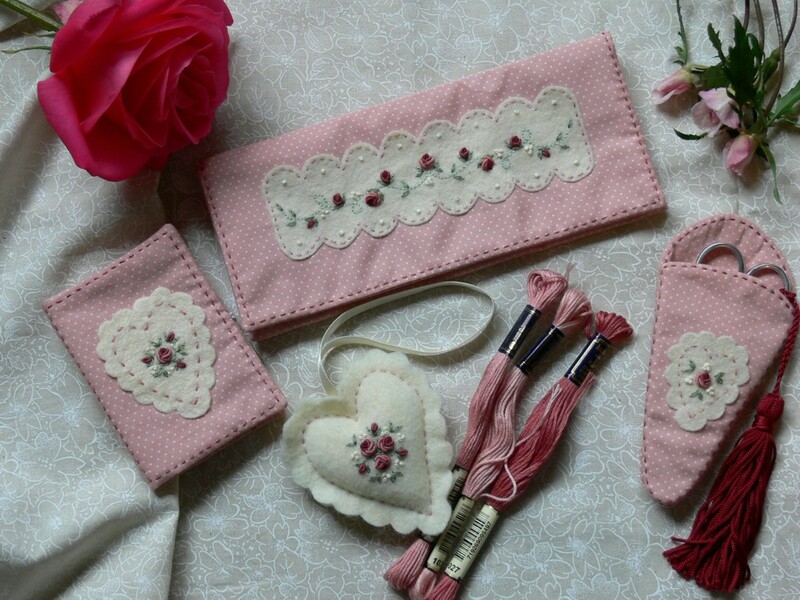 Each piece is beautifully embroidered with delicate grub roses. Pearls and guipure daisies provide the finishing touches.